Gearlux cables have been designed and tested to provide you with years of dependable use. High quality and professional materials make this cable ideal for studio use as well as rigid live applications. 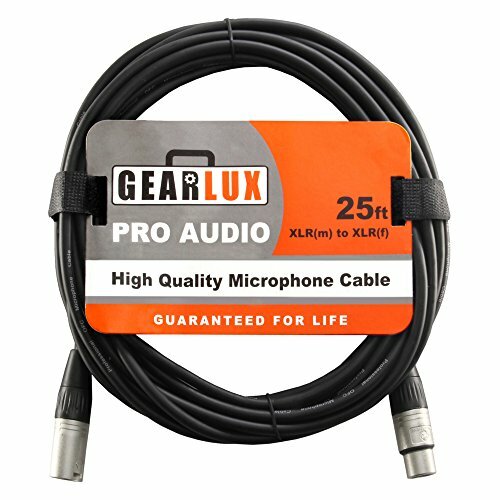 The Gearlux 25-foot microphone cable is made with an Oxygen-Free Copper (OFC) conductor in a noiseless cable which enhances the signal clarity and reduces any outside interference. The connectors are housed in tough metal that are easily serviceable. A XLR male to XLR female cable is a staple in every studio, practice space, theater, church, you name it, just about every microphone will universally connect to an XLR cable. So pick up a couple more why your at it. With the Gearlux XLR microphone cable you can rest assured knowing that your signal will remain true to it's source.